Troy will be opening for Berry for her autumn tour and play some other shows at the end of summer : see tour dates page for details. 2 new interviews, one in french on Converse or not Converse, the other one in english and 3D video (!) on Fiese Falle, a german site. TVB's song Dogs appears on Folk and proud, a CD compilation released by Naïve, also featuring Devandra Banhart, Andrew Bird, Great Lake Swimmers, Girls in Hawaii, Cocoon, Laura Veirs... See discography. You can listen to Catt, a song already appearing on the TVB live in Paris DVD on Troy's myspace page. TVB's song Heroic Little Sisters appears on Modern Folk, a CD compilation released by Wagram, also featuring Devandra Banhart, Feist, Sufjan Stevens, Andrew Bird, Minor Majority... See discography. Primavera Sound festival confirmed: see tour dates page. 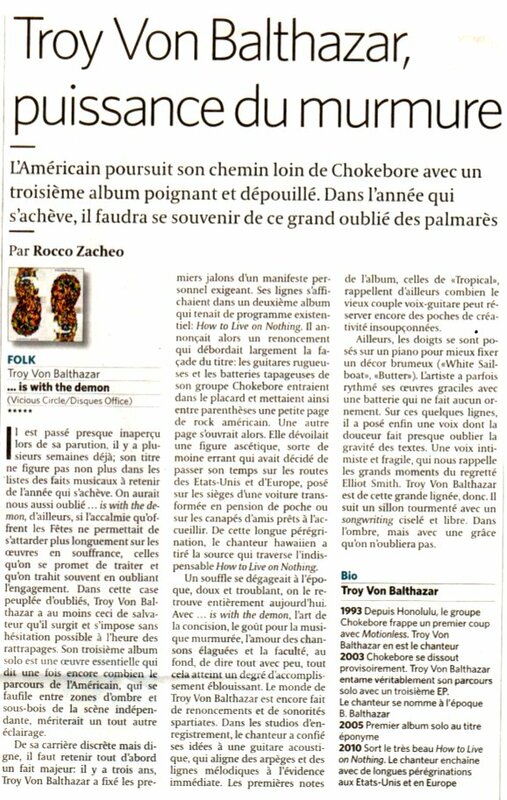 Review of the Six-Fours show on Metalorgie (French).